Novak Djokovic came through a gruelling three hours and 15 minutes match against Russian number 15 seed Daniil Medvedev to reach the quarter-finals of the Australian Open for a tenth time. The world number one has his best overall Grand Slam win-record at the Australian Open with 65-8, and has worked his way back to his peak powers following a two-year absence from the last eight of the tournament. The Serbian has won the Australian Open six times, and has an overwhelming record against his quarter-final opponent Kei Nishikori, whom he has beaten 15 times to the Japanese’s two. World number nine Kei Nishikori has battled his way to the quarter-finals with three five-set victories under his belt, including his fourth round encounter with Pablo Carreno Busta in which he came back from two sets down. Nishikori is unbeaten so far in 2019 having come into the Australian Open with the Brisbane International title to his name, in which he beat Novak Djokovic’s fourth round foe Daniil Medvedev in the final. 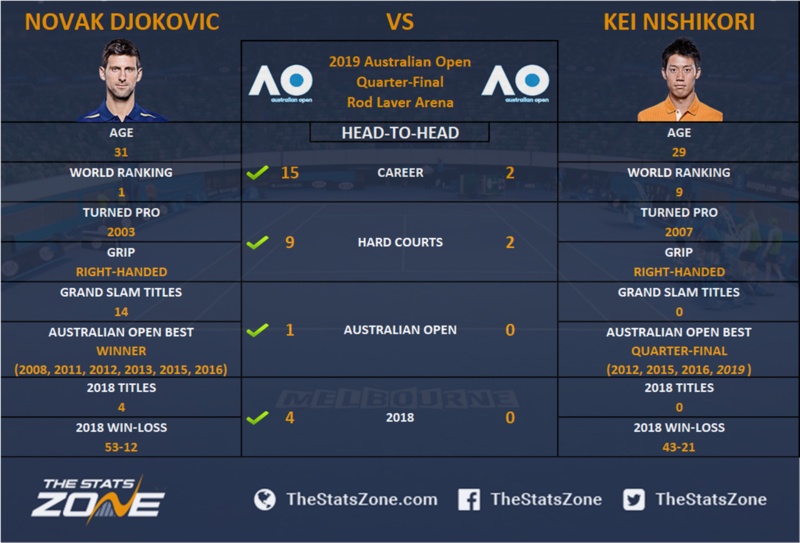 Kei Nishikori’s record against the so-called 'top four' over the last decade leaves much to be desired, and he has played, and lost, to his quarter-final opponent Djokovic an inordinate amount of times with a 2-15 win-loss record. Nearly-man Kei Nishikori has been a consistent top ten player for much of the second half of this decade, but he has never progressed from the quarter-finals of the Australian Open, nor any Grand Slam apart from the US Open, and his 17 matches played with Djokovic speaks volumes about his chances. The Japanese star has beaten Djokovic twice, both on hard courts, but not since 2014. Interestingly, the pair have never played a fifth set, where right now Nishikori’s fitness could aid him, but Djokovic’s mentality will surpass any determination from a player that he has an 88% win percentage over. DJOKOVIC TO WIN IN FOUR SETS.